I traveled to Spencer, IN this weekend to decorate for a sweet little 3 year old birthday party. This was a very special birthday for Molly. She was diagnosed with Leukemia just a few months into her little life and this was the first time she was able to not only celebrate her birthday, but also good health. The super cute kiddie tables and chairs were from Table Tops For Tots. I folded the napkins to look like Sponge Bob’s little white collared shirt and added a little ribbon tie. Here is the sign we made for Molly’s cake table with some added glittery sea fans, coral and faux water. This entry was posted in Sponge Bob Party, Under the Sea Party on October 24, 2010 by Setting the Mood. Guests were welcomed by this “Living Red Carpet” entrance. 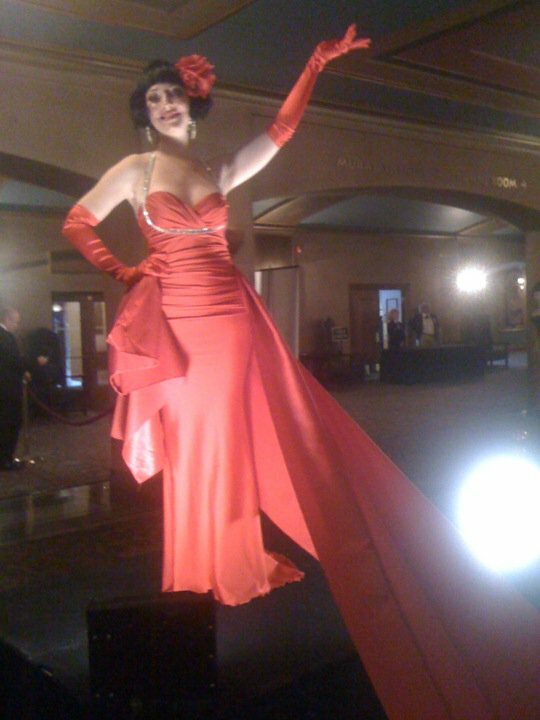 A live model stands atop a platform with a loooong red train that the guests actually walk on like a red carpet. 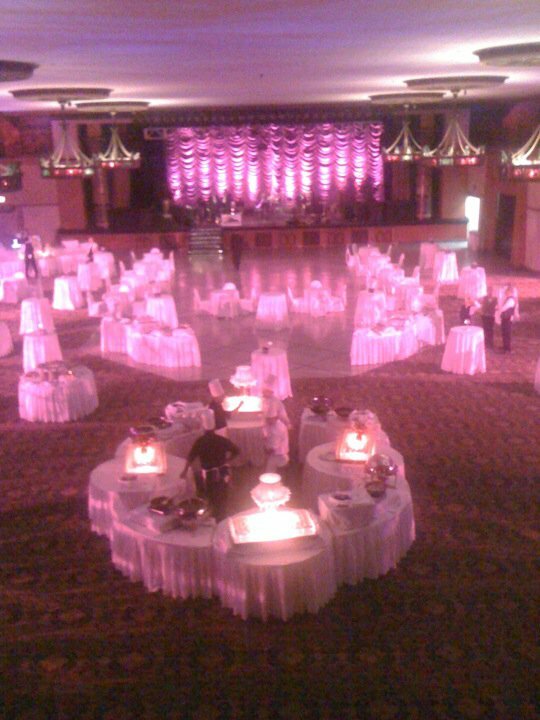 Annie O’s Events did a great job of pulling this event together and she hired us to do some special decorating touches. This is a wide shot of the room. I love the elegant draped backdrop for the band. It looks so Hollywood to me and with the way the lighting hits it makes it even more glamorous. 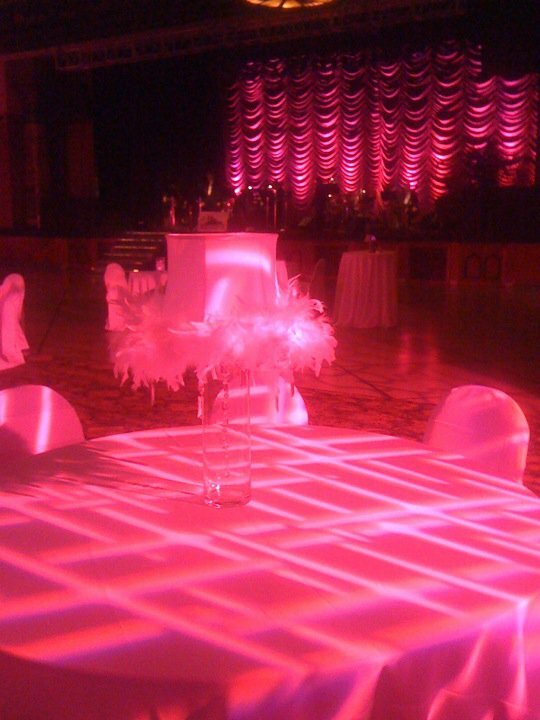 I love this photo that Annie O’s took…it shows the patterned lighting on the tables. 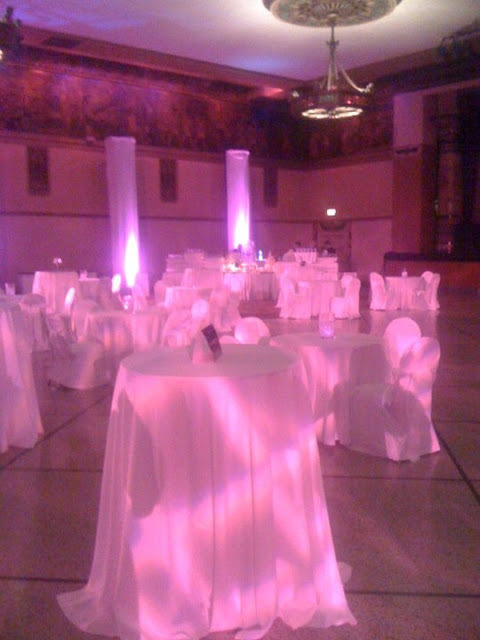 The centerpieces were boa rimmed lamps lit with pink lighting. This is the beautiful ice sculpture by Jose & Son’s Ice Carving. Check out the carved papaya flowers. Jose & Son’s carves fruit too! This was a giant slab of ice with pink under lighting. The ice served as a tray for the cups of ice cream. This entry was posted in Afterglow Party, Heartland Film Fest, Movie Party on October 23, 2010 by Setting the Mood. You must check out Khaliah at The Party Muse! Not only does she have super cute stuff in her Etsy store but she is one of the sweetest blogger girls I’ve met. We met over at CPN and she asked me if she could interview me for her blog! Below is the interview…thanks Khaliah!! I’m so excited to have had the opportunity to virtually meet such an inspirational party designer as Jamee Bryant of Setting the Mood! To say that I admire her style, her designs, her parties would be a huge understatement. I think since I’ve been introduced to her work through the fabulous CPN, I’ve become one of her biggest fans. Her designs are beyond words, and sometimes gravity defying 🙂 Even though she so graciously answered all of my questions, I’m still not quite sure how she does it. I’m definitely going to approach my parties a lot differently since having the pleasure of being introduced to her work….I think she will make us all think a little bigger….literally! Here’s a look into her BIG party style. In one of our conversations you let out a past career of yours. What did you do before you were a party planner? What inspired that transition? Believe it or not I was a police officer (for two years). I was in college and finishing my degree in Criminal Justice when I took my first art class (oil painting) and from there, I knew I wanted to do something creative for a career. I had built my portfolio up to a whopping 3 pieces and had the nerve to take them to an interview for an art restoration job at the Scottish Rite Cathedral. They hired me! To this day, I can’t believe I got the job. It was a contract job where we restored murals, stained glass, and woodwork. That was a contract job that lasted a year so when that was over I began begging my way into the event planning field. I snapped several shots of table settings that I set up around my house and put them in a portfolio and called on some event planners. To this day, I have that portfolio and get it out for some laughs. It was really really bad and I can’t believe I was hired once again. I guess it was in God’s plan for me to do this because I certainly shouldn’t have been hired from my portfolio. What was the first party you ever styled and how did you get that job? The first paying party I ever styled was for a wedding for 100 people that was a referral from a friend. This was way before I even had business cards or a registered business name. I charged $150.00 for my services!! Crazy to think of that now! It was a HUGE learning experience and I’m grateful I had the opportunity to see if I could do it. I’m sure you get a lot of BIG reactions to your events! What is the funniest or most memorable reaction you’ve ever gotten when a client has walked into a party that you designed? Oh, the one I think I will always remember was the Wonder Woman party that I did about a month ago. The little girl’s eyes and mouth were wide open when she walked in. She ran right over to her dad who was filming the whole entrance and hugged him and thanked him. Her mom and dad were both crying at her reaction. You’re props are awesome.Do you do all of the design work yourself? Yes, we create and design all of our stuff. Props, centerpieces, signs, party favors etc. My husband builds the larger props and does the graphic design and I’m the idea and detail girl. Do you have a studio at home where you create these works of art? Yes, I have a studio in my basement and recently started renting a warehouse to store everything in one place. I would love to get my studio out of the house and into one space someday soon. Are all of your props handmade? I would say 95% of our props are handmade and the rest is bought or elements of them are purchased. Did your style evolve with your career or did you start out making these huge masterpieces of décor? Oh, I think it has definitely evolved. Trial and error has enabled me to figure out what works and what doesn’t. Sometimes what seems to be a mistake has turned into the best idea ever. I love just going for it and seeing what comes out. Having the style that you do with your parties, what would you say was the most difficult part of bringing your vision for your business come to life? Well, for me…I have a hard time with the business aspect of the business. I just don’t like doing the paperwork, contracts, and accounting stuff. I would rather just make stuff and let someone else handle the office stuff. I’m really bad about it and procrastinate that part all of the time. What advice would you give to someone out there that sees your parties and wants to style events on a grand scale such as you? It can be overwhelming at times but it ALWAYS works out. Don’t be afraid to try. If you are anything like me, you just have to jump in and do it and your confidence will build from there. This entry was posted in Setting the Mood Interview, The Party Muse on October 15, 2010 by Setting the Mood.